When installing headers on an LT1, due to increased distance of the o2 sensor a change in exhaust pressure near the o2 sensor, as well as a slight increase in resistance due to o2 extensions, and an operating temperature difference, increasing the o2 swing voltage about 20mv is reccommended as partial compensation for what usually becomes a slight lean condition. An oppisite factor is the greater overlap of longer duration cams, which causes corrupted o2 readings at low rpm. This usually manifests itself in a rich condition. Decreasing these values slightly may help compensate. Some experimention may be required, and reading plugs may be the best way to get it just right. 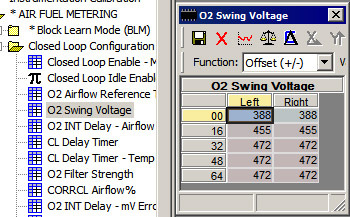 Pushing these values lower than 400mv or higher than 600mv will probably result in a loss of closed loop stability. Changing the distance of the oxygen sensor in relation to the exhaust valve will change the time that exhaust gasses (and obviously the fuel corrections being measured by the oxygen sensor) will take to become measurable. As the stock calibration expects the change to be measurable fairly quickly, the integrator becomes particularly unstable and innacurate if the delay is not increased. The effect is more dramatic at lower airflows. 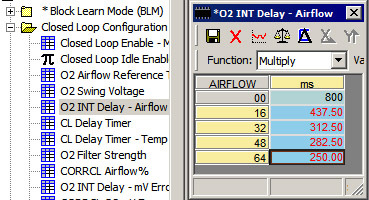 Making the integrator delay too large may result in a delay in fuel corrections, but increases stability dramatically. For longtube headers, doubling or even tripling the integrator delay is reccommended.